In November 1930 a cornerstone was placed in what would become known as the Black Building on Broadway in downtown Fargo. A remnant of that period—a price tag bearing the words “The Store Without A Name”—lives on as an artifact adorning a recently remodeled office of the eight-story icon. “We found it (the price tag) in one of his old offices here,” Olson said while giving a tour of the building that George Black built. 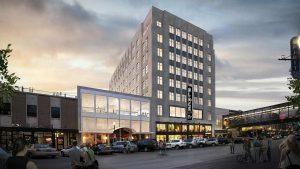 “The building has always been office space on the upper floors and retail on the first three levels, it will continue being that,” Olson said. Olson said when The Forum printed a Special Edition to welcome the Black Building to Fargo, it ran a picture of the lobby with a caption stating that more than 4,000 people daily walked through the building’s doors. “If that could happen again, we’d be pretty happy,” Olson said.